Once a common, but notorious, smuggler, Davos chose to smuggle in supplies to the besieged Storm’s End during Robert’s rebellion. The food he provided allowed the garrison to hold out against the besieging force under Lord Tyrell. Stannis Baratheon rewarded Davos by raising him to knighthood, at which point he took the name Seaworth and the sigil of a black ship with an onion on its sail in memory of the deed… but Stannis also required punishment for Davos’s smuggling past, ordering that the first joint of each finger of his left hand be removed. Davos asked Stannis to do it himself, which he did. 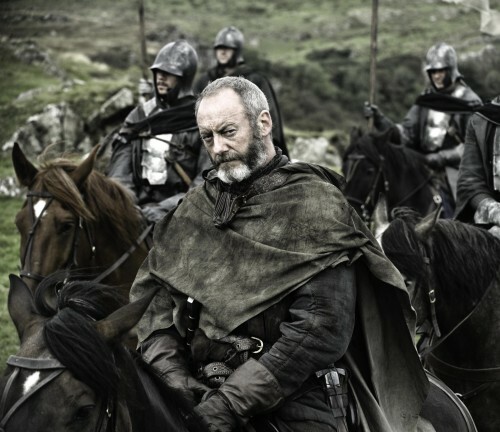 Since then, Davos has served Lord Stannis as he became Lord of Dragonstone. He holds lands in Cape Wrath, where he keeps his wife, and has seven sons, the next youngest of which—Devan—serves as Stannis’s squire. Obviously, the actor cast in the role is not lacking in finger joints. A special glove and occasionally CGI to convey this. As Liam Cunningham is left-handed, it’s his right hand that will seem to be missing joints, as opposed to Davos’s left.